Ever have one of those days where you just don’t want to do a damn thing? I don’t feel sick, or really that tired (and only a tad sore from the last few workouts), and all I want to do is go home and veg out in my jammies. Ok, I probably lied a little bit. Now that I think about it, I am pretty effing tired and super sore and just want to NOM the hell out of all the junk in the house (note: there is like NO junk in our house, which gives me a big huge sad face on days like this). Woof. I just wanted to check in today and share with you the workout I did last Wednesday that I said I’d post. So, to give you a bit of info about this workout: there are three sets of three exercises (first set are compound exercises, second set focus on upper body, and third set focus on lower body). 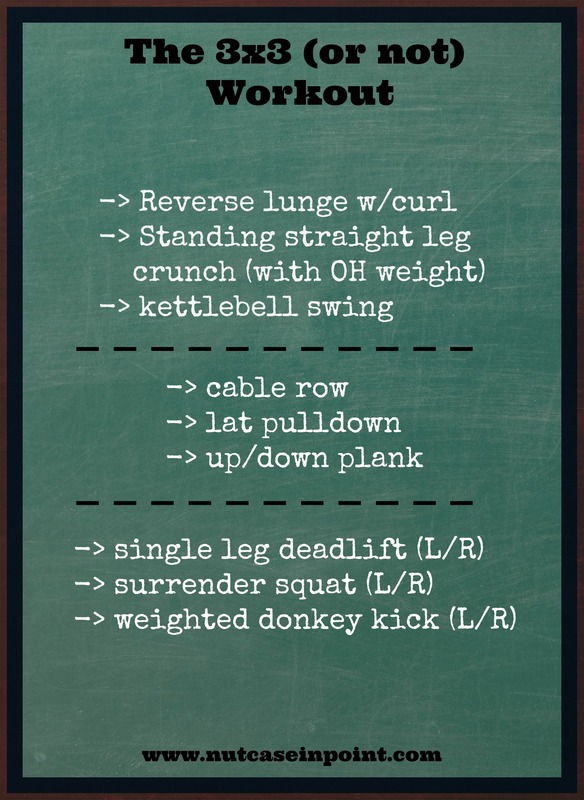 When I wrote up the workout, I originally decided on completing 50 reps of each move. Then I thought maybe I’d nix that and attempt rounds to fatigue of each set before moving to the next. I finally went with lumping the 9 moves together and moving through the list, completing 10 reps of each at a time. I managed to get through it 4 times before hopping on the treadmill to finish off with some intervals before it was time to get back to work. Moral of the story: you can do this workout any way you’d like! go home and eat Ben & Jerry’s and think about the workout (unless you live in Canada, it’ll probably be Chapman’s ice cream since B&J is like $30283520386 a pint). There ya have it! Now I want a nap. This looks awesome – I love the different suggestions for how to do the moves, too!! I like the idea of 50 reps of each straight through!!! Awesome Workout! Can’t wait to try it.